Discussion in 'Cellaring / Aging Beer' started by jmdrpi, Jan 1, 2019. I had OG BCBS vanilla over the weekend. Not too bad. Definitely had some oxidation but vanilla was still present. Body was a little thinner than the OG rare i had at thanksgiving. Had VR next and it was notably better. OG Nilla....drink em if you got em. argock and Bitterbill like this. Yeah, I think the regular Darkness holds up well. From my relatively short experience of cellaring BA stouts it's best not to sit to long. I haven't found any that really improve past a year. I followed up by drinking a one year old bottle and liked it much more. I had thought BA Darkness was high ibus like regular Darkness (80 ibus I believe which I don't like fresh but really like aged) so that's why I wanted to aged it as I don't like hop bitterness, but in researching it the BA variety is actually low bus. One of my all time favorite non “gussied up” stouts. Just all around solid without adjuncts or barrel aging. Forced the pour and didn’t see any head for a few seconds but it did eventually erupt into the copper colored head you see pictured above. Nose is a touch hot but not so much as to mute the carob, vanilla and fig that came next. Taste is big on fig and coffee, like a coffee bomb. Never recall as much coffee when fresh. Finishes out with a solid slap of molasses before coffee returns to dominate the aftertaste. I would say that this stood up very well for being just a few months shy of 5 years. Dragginballs76, bl00, strohme2 and 14 others like this. That beer is amazing with about 4-5 years on it in the cellar. I have a 2014 I think I'm going to crack open soon. bl00, gopens44 and ManBearPat like this. My latest is a Great Lakes Brewing Company High Striker Single Belgian Pale Ale. The bottle I am enoying is about 4 years old. Here's a link wth my original review from 4 years ago and my review of it aged that I just added. THis is a good one. I think I lke it a bit better now. TheGent, bl00, argock and 2 others like this. Certainly has oxidized some. It's taken on a light fruit quality (as opposed to darker fruits, not less fruit). A bit airy. Nice tan dense head shows carbonation to still be strong. Darker fruit in taste with some raisin and plum. Quite dry. Shot of warmth hits the gut. Still a standard version of style. Straight ahead but not particularly complex or overly interesting. But for the price a way to engage in this style. Glad your bottle held up. I had a 2013 recently and it was clearly WAY over the hill. Tons of oxidation. Such a fantastic beer fresh - a true delight. BigIslandfarmer and garymuchow like this. Unbelievable. Honestly didn’t taste a whole lot different than a freshie IIRC... great bourbon and chocolate flavors, boozy but like gentle warming not hawt. Some oak and roasty notes... we were both thoroughly impressed. bl00, Bitterbill, CaptainHate and 1 other person like this. Here's my review of a little beer called Beatification from Russian River that I aged for almost 2 years. 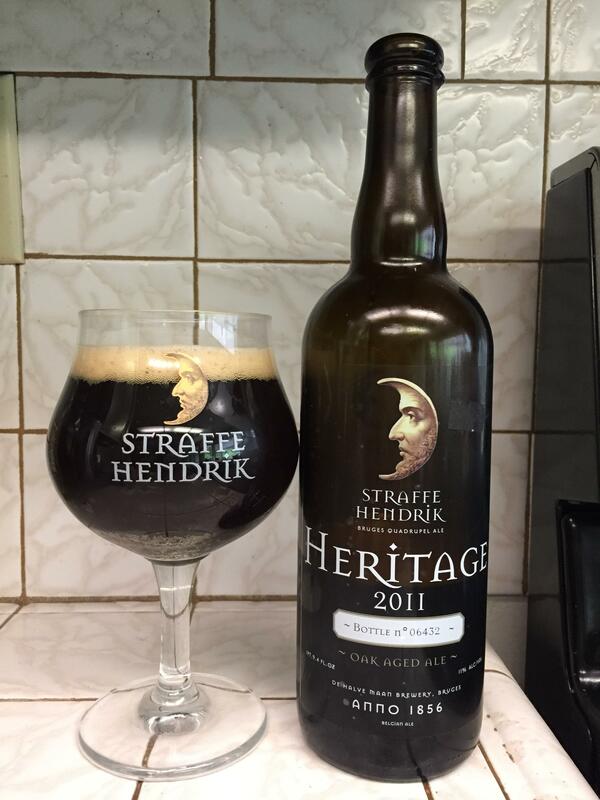 2011 Straffe Hendrik Heritage. Purchased new and cellared properly since. Poured from fridge temp, but allowed to warm. Lots of carbonation was evident after the cork was pulled. Nose is really nice - a lot of raisin, toffee, and dark fruit. The taste is pretty good, but has definitely fallen off since fresh. As with most quads, I think the sweet spot is probably around 4 years. The taste is a bit of port, cherries, wheat, grapes, toffee, and raisins. Some oxidation is evident, but not overwhelming. This is still really nice. TheGent, bl00, BalancingBrooms and 7 others like this. 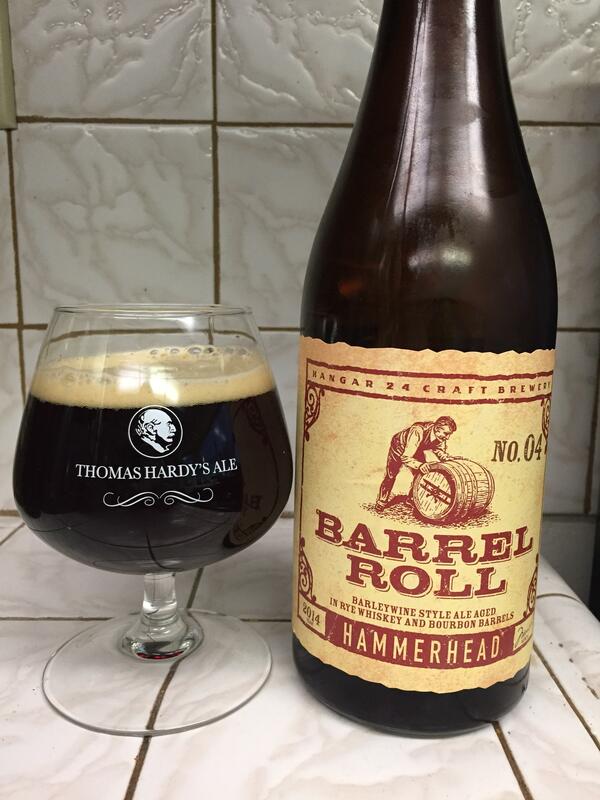 2014 Hammerhead from Hangar 24. A barleywine aged in rye whiskey and bourbon barrels. 5 years old, and smelling great. Lots of toffee, rye, and bourbon on the nose. Taste has mellowed out since fresh, with a touch of bitterness replacing the initial sweetness. Some leather and burnt wood has taken over. There was more of a bourbon sweetness when fresh, so this has changed quite a bit. In all honesty, I prefer this fresher. I'm kinda bummed that I held on to this for so long. TheGent, bl00, BalancingBrooms and 4 others like this. Decanted carefully into a clear glass snifter after sitting at room temp for 30 min. Clear burgundy with no head but lots of legs. Crystal malt assault undoubtedly with toffee, burnt caramel, and Tootsie roll all on the nose with vanilla, pineapple, and coconut. Boozy without paint thinner, etc. Flavor is a ball buster for sure, tons of candied date, rum raisin, and bourbon soaked prunes. Very fruitcake-like without the weird candied green or red bits (maybe I decanted those behind!). The toffee and burnt caramel come through like overstrong flavored frosting. Like coffee notes with more Tootsie roll in the finish. Big alcohol cherry-Berry sweetness in the finish too. Some earthy bitterness but could use more to counteract the sweetness which is intense. Drinks pretty heavy but not ungodly. Low carbonation not surprisingly. Crazy flavorful but intense and a rarity to pull out but highly enjoyable. TheGent, bl00, youradhere and 5 others like this. 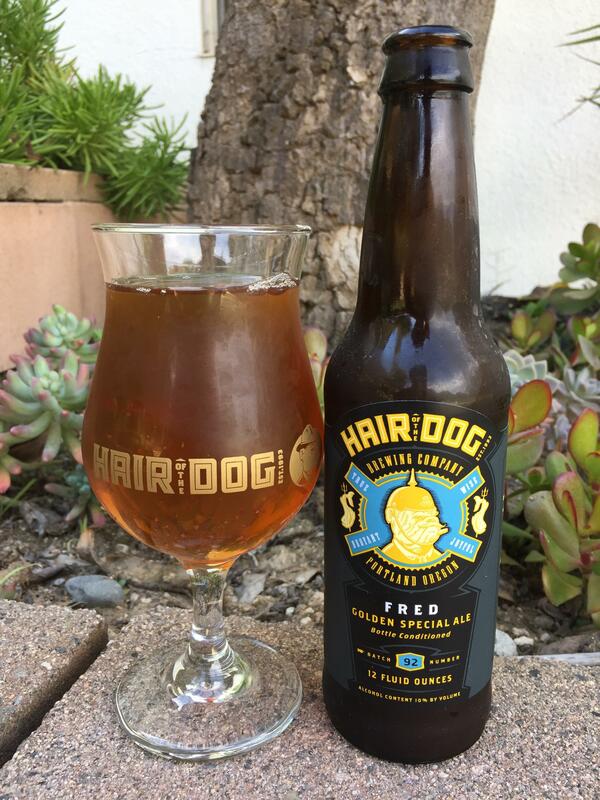 2014 Fred from Hair of the Dog (batch 92). Poured from fridge temp, but allowed to warm over about an hour. No sound as the cap came off, as expected. Nose reminds me of an American barleywine - nice sweet candy, toffee, and hoppy notes. Taste is amazing. Some leathery funk mixed with some nice sweetness. It's a unique mixture of flavors, but one that works for me. Definitely some bread, tree sap, barnyard funk, and resin. Very strong toffee and oak. A tad syrupy, but again this is expected due to the lack of carbonation. I kind of get this from most HotD beers. This has aged really well, and I look forward to revisiting in another few years. Samlover55, TheGent, bl00 and 5 others like this. About one finger of frothy khaki colored head. Disipates quickly to a frothy collar. Black body. Nose is a touch oxidized. Some vanilla, chocolate, and dark fruit. Well integrated. Very different than when fresh. Very little bitterness and no booziness. Starts with dark fruit and chocolate. More dark fruit in the middle of the mouth. oxaidation is very slight. Finish brings fruity, chocolatey dark roast coffee. Bitterness to balance out the sweeter notes. Some vanilla underlying. Low carbonation. Medium bodied for the style, but a bit syrupy due to low carb. Bitterness on the backend does a good job of balancing things out. I don't recall loving this fresh. Too bitter and boozy. 5 years in the cellar and both of these characteristics are gone. May be a bit too oxidized for some, but I enjoyed this more than fresh. TheGent, bl00, JimmyTheDook and 6 others like this. AirBob and ManBearPat like this. Yes it definitely is cellarable, and I’d say your estimate of 2-3 years is spot on. I opened one I had for about 5 years (forgot about it after a move), it was ok, but was fading and getting a little cardboard-ey. Of course that could be a number of other issues that caused that too. AirBob and stevepat like this. AirBob, Bitterbill and stevepat like this. Bitterbill and ManBearPat like this. I personally prefer it at one year. But it's a fun beer to buy a sixer and have one every six months. strohme2, Budlum, Bitterbill and 5 others like this. 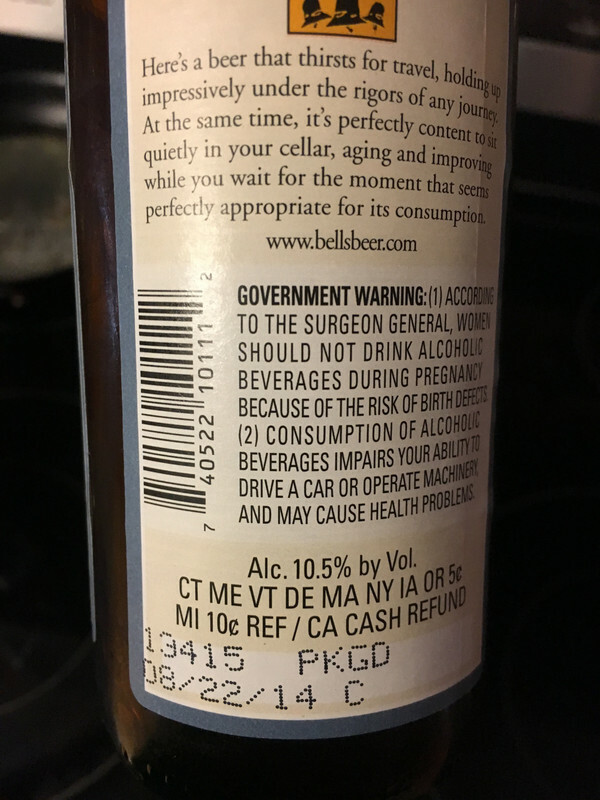 2017 12.7 ounce bottle pulled out of my cellar fridge (at first pulled out a 2018 I didn't know I had; nice cellar inventory control). When I popped the cap, a boozy barrel smell immediately was detected. Poured into a DFH tulip, there was almost no tan head topping an inky brown body. Smell is just gorgeous with caramel and molasses over the previously mentioned pleasant aromas. At the first sip I got a brown sugar taste blast which quickly faded as the stout warmed up. Then I detected an unpleasant bitter alcohol taste which made me think WTF, but that too went away with the warming. Still I'm wondering if maybe I've sat on this too long and it's developed some off tastes; I'll try that discovered 2018 in the near future. With further warming I'm detecting some malt char which was buried earlier. Mouthfeel was a bit thinner than I was expecting; not bad but still thinner. 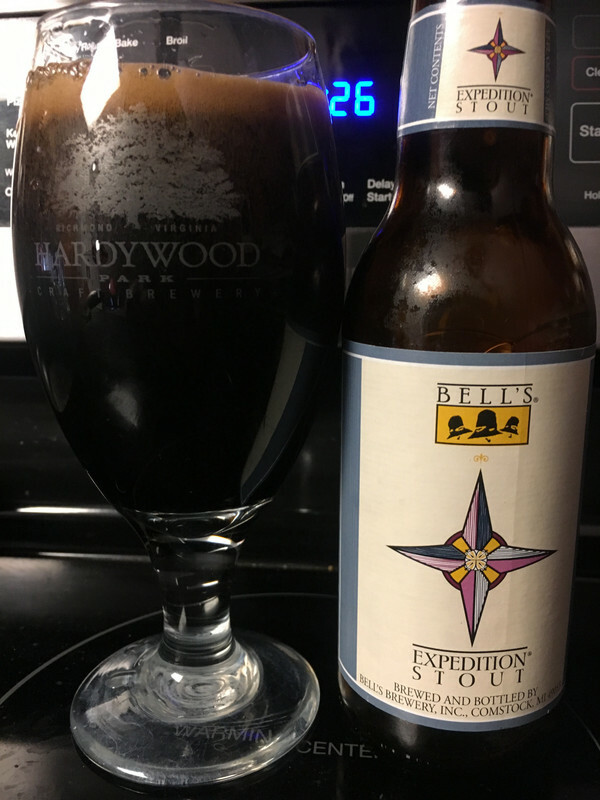 This was obviously a positive experience but I'm not sure that the barrel aging made that much of an improvement over the base stout, which I enjoy a great deal. Further testing required! 7irondave, Bitterbill, bl00 and 2 others like this. 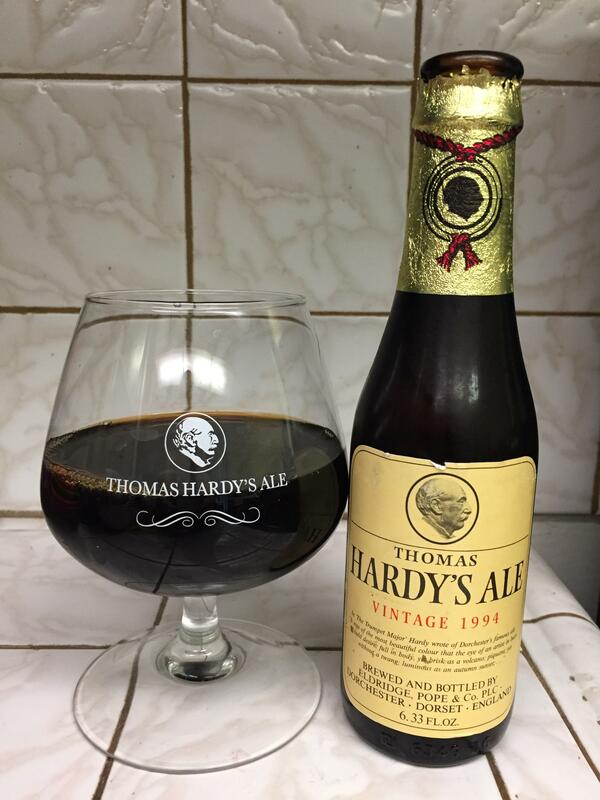 1994 Thomas Hardy's Ale. Not a sound as the cap is cracked. Simply amazing. Huge notes of caramel, brandy, chocolate, vanilla, raisins, candy, and nuts. Definitely expands in flavor and smell as it warms. I'm in heaven right now. jhavs, Jesse14, SABERG and 11 others like this. I bought about a year ago, and has been in the cellar since. I don't know if this will do justice, but here goes. Overall this is by far and away the best beer I've ever had, perfectly balanced, aroma that has depth, and a never ending finish. 7irondave, DIM, Budlum and 8 others like this. 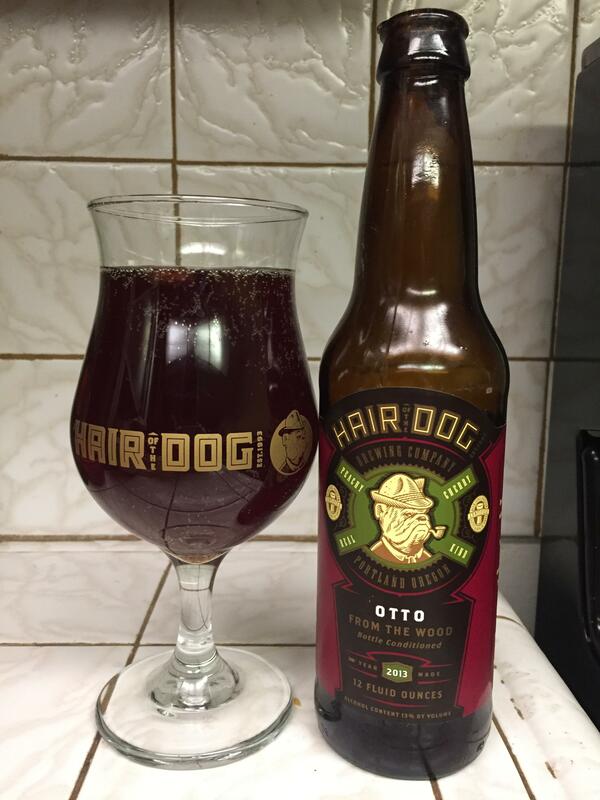 2013 Otto from the Wood from Hair of the Dog. Poured from fridge temp. Actually has some carbonation, which is impressive for a HotD beer. Also 6 years old! Look is dark brown with very slight head. Nose is raisin, candy, caramel, wet wood, and a touch of bread. Taste follows the nose. Semi-sweet upfront, with big notes of candy and raisin. The wood really comes through, along with cherries and raspberries. Really nice stuff. DIM, SABERG, Lingenbrau and 8 others like this. 3 fingers of fluffy khaki colored head. Slowly disipates to about 1/2 finger of dense, creamy head with a substantial collar. Body is nearly opaque - slightly red-brown. Nose is dominated by sweet dark fruit notes. Subtle notes of leather and chocolate. Touch metallic - like copper pennies. Sweet dark fruits are not the dominate flavor. Starts with dark fruit and leather. Middle of the mouth is fleeting - a bit of dark fruit quickly shifts to earth and bitter chocolate. Finish is dry, bitter, and assertive - earth and extremely bitter coffee (like if you left french prrss steeping for way too long). Too bitter for my tastes. Fruit punches through the bitterness deep into the finish, but not enough to balance it out. Fair amount of carbonation. Thin body. Dry and bitter finish. Past its prime, but has some redeeming qualities. Near perfect for the style visually. Nose is deep and enticing. Unfortunately, this just way too bitter and unbalanced for my palate. Beersnake1, DIM, bl00 and 1 other person like this. This one's a gusher - not a great sign of things to come. About one finger of fluffy white head. Dissipates quickly to a thin cap. No collar but great lacing. Body is muddy brown with visible floaties. Nose brings toffee and cherry. Perceived tartness. Maybe a bit if chocolate underlying. Flavor is tart cherry with a bit of leather underlying. Finish is tart with some underlying earthy bitterneee. It's bearable and balanced, but not what I expected. Maybe a bit of vanilla and wood lingering on the tongue. Thin for the abv and style. High carbonation. Definitely well past its prime. The flavor profile works but not what I was expecting from a BBA lager wine. Likely some kind of unwanted bug in play here. The tartness makes it deceptively drinkable for the abv and style. Beersnake1 and bl00 like this.